What a pleasure it has been! Here I am a kilo or so heavier and my wallet is about the same amount lighter. Yarra Council has also done extremely well with parking fees. 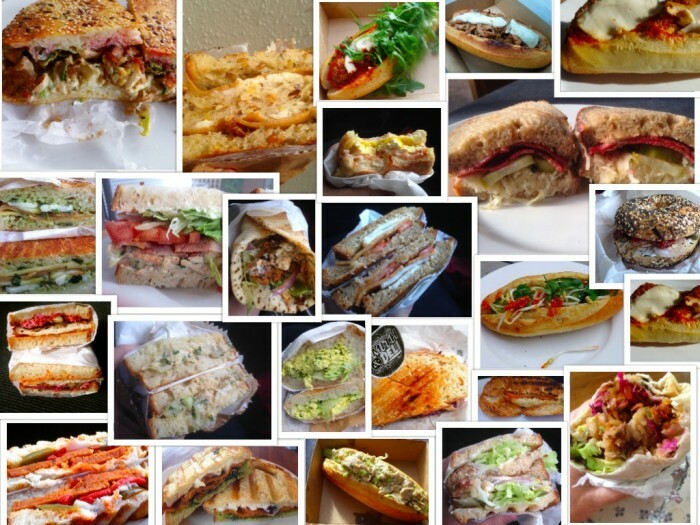 I’ve eaten almost the entire sandwich list and quite a few other things besides. The pies, ready made meals and sweet things are great too. It has been a lot of delicious fun. Many of the staff at the Deli knew me by name by a few days in, and knew of the project. They are all wonderful people. I had them make suggestions as to their favourites and the specials I should try. The opinions are genuine, as they would be regardless of whether I paid or not. But in the interests of full disclosure I purchased all of the sandwiches except the final Home Alone. Mo wouldn’t let me pay for the final sandwich, she kindly gave it to me as a gift for finishing the project. 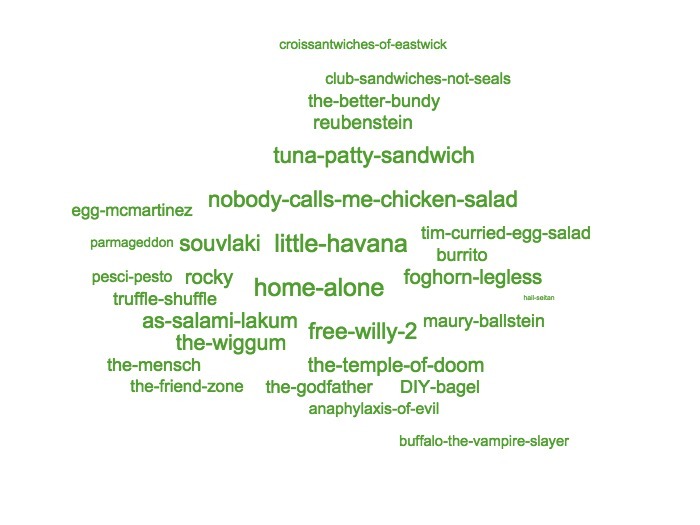 Here is a sandwich word cloud. The size of the words is based on my rankings. Hail Seitan! – pineapple in a sandwich, erk! So that’s me signing out from #veganmofo 2015. What a stellar effort! Ha, imagine if another new vegan place opens up next year before Mofo– there’s your 2016 theme! I just wanted to say thank you so much again for the past 30 days, loved each and every comment. Haha, I couldn’t even read Hail Seitan without enlarging the image! If it had included a slice of pineapple it would have been invisible. That was one mo-fo challenge, for sure! Well done and congratulations on making it to the finish! Thank you for such an honest, entertaining and detailed run down of all those delicious sandwiches, really enjoyed it. I’ve sorted out my favs so just a matter of time before I get started, just a little tricky living in Country Victoria but I intend to make it my mission! !